Soaking foods? I know this is good for me, but I don’t really have to time to add one more thing. AND I have no idea where to start. It’s overwhelming, something I’ve never had experience with and don’t know anyone who does it. I get interested in spurts… a few years ago (when I first started reading Nourishing Traditions) I looked into soaking grains but then our diets changed and that went out the window. I was actually really happy about that because soaking grains, dehydrating them, grinding them and then baking is A LOT of work and I didn’t think I really wanted to start all of that! I have wanted to do some simple sprouts for our green smoothies and in our cooking. Again, not something I’ve gotten in to although it is on my list. I know there are all kinds of cool contraptions for doing this, but I know I can come up with something on my own if I really want to get started. I’ve had other priorities at the moment though! However, we eat A LOT of nuts! That is one of the few snacks that the whole family can enjoy along with dried fruit. I had been just buying the Costco brand almonds and mixed nuts which we really enjoyed a lot! The more I purchased them and the more we ate the more I felt like we needed to change! If you haven’t noticed that is the way it works in this house. As we start eating more of an ingredient the more I research it and the more our purchasing habits start to change. We aren’t 100% organic mainly due to cost. I would love to be 100%, but it just isn’t an option at the moment. We do, however, purchase organic the foods that we eat the most of. We eat a lot of dairy, beef, pork and chicken. All of these items we decided we were going to start purchasing through a farm co-op. We have LOVED this. It’s great to get to know the farmer and know their products are exactly what you want. The meats are organic and grass fed/finished and the milk and associated products are raw. We also get our eggs (free range, organic) from a local farmer. As I just mentioned, and as I think is true for most families, cost is important. I’m always looking for a good deal on organic raw nuts. If you have any leads I’m interested! I did a cost comparison about a month ago. Click on the link below to review the prices I’ve found. I’ve been purchasing from Trader Joes for now because their prices are best for the most part, with no shipping, no minimum purchase and not having to purchase in bulk. If you know know of another place I’d love to hear about it! So on to soaking…. I’ve done a few rounds through the dehydrator and they’ve turned out great! I’ve so enjoyed these nuts so much more than anything I’ve ever purchased! The process is super simple and thanks to The Nourishing Gourmet she has a great post/chart about how long to soak and dry each. It basically consists of mixing the salt water, soaking the nuts and then dehydrating them. Depending on the type of nut the amount of time needed to soak and dry will vary. I usually do about a pound or two of three different nuts or seeds at a time and then pick a different variety the next go round. They end up being super crispy and have a slightly salted flavor! Mmmmm… They don’t last long! Oh… I almost forgot to mention the incentives for soaking nuts! First off when you purchase raw and organic nuts, they are minimally processed and clean. Then you know exactly what you are putting on them and can be certain there aren’t any unwanted preservatives. 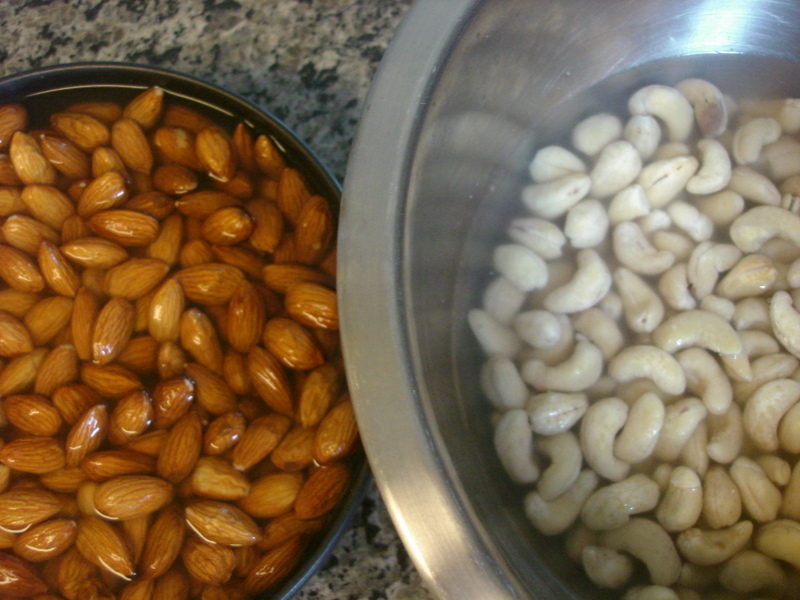 Also, by soaking nuts it makes them easier to digest, by breaking down the phytic acid and enzyme inhibitors. Nuts have A LOT less phytic acid than grains, so that isn’t as much of a concern… however, the enzyme inhibitors are great for the nut… but not for our stomachs! This inhibitor helps to prevent the seed from sprouting and is a natural preservative, but it is very hard on our digestive systems. So by soaking, we can break down that enzyme and partially digest the nut or seed before we even eat it. Not only does this help our intestines, but we are more likely to adsorb all the nutrients that are contained in the nut or seed as well. This is my first foray into soaking (except the granola) and it’s going well! Have you soaked? Interested in it? Gonna give it a try? Tell me about it! I always soak my beans and I add a Tbsp. of apple cider vinegar during the process to help them be more easily digested. I’m looking forward to getting a dehydrator so that I can start soaking nuts as well!